"Between two recording sessions, Johnny did the rounds of the night clubs with Lee Halliday, and was knocked out by the stage presence of Jimi Hendrix, who wasn't under contract with a record company, and was performing only in the "underground" clubs. …Then, between November and December of the same year, Johnny was again recording in London while Jimi had a hit with "Hey Joe" (not exactly true, it came out in december but became a hit early the next year). 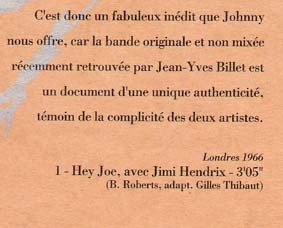 While Johnny was recording his own version of "Hey Joe", his mate Jimi came to the studio and spontaneously recorded the acoustic guitar on the track which Johnny sang. This tape was put aside and forgotten until today, whereas another take was remixed by Rod Guest and released in early 1967 as a single. 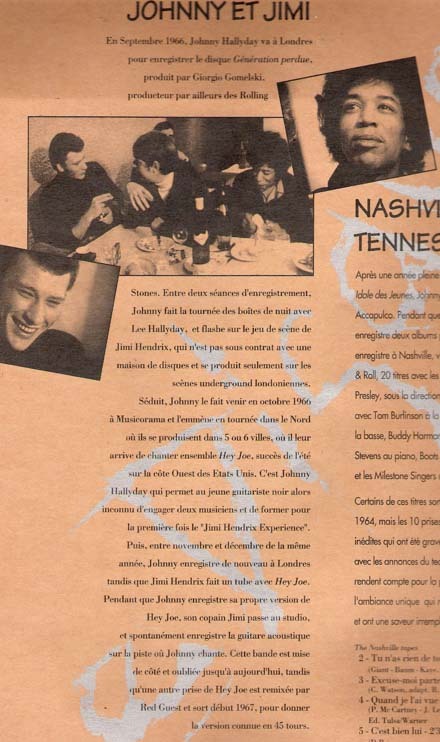 So, it's a fabulous unreleased track that Johnny offers us, because the original unmixed tape, recently rediscovered by Jean-Yves Billet is a document of unique authenticity, and a witness to the complicity of the two artists." < A piece of film exists of this scene of Jimi blowing smoke rings with Halliday. From left to right: Johnny Halliday, Chas Chandler and some black geezer. in the hope of getting Johnny to sign one of his E.P.s that she possessed. three unknown musicians who belonged to a group called The Jimi Hendrix Experience! This was to be the bands second concert since their creation only days earlier. 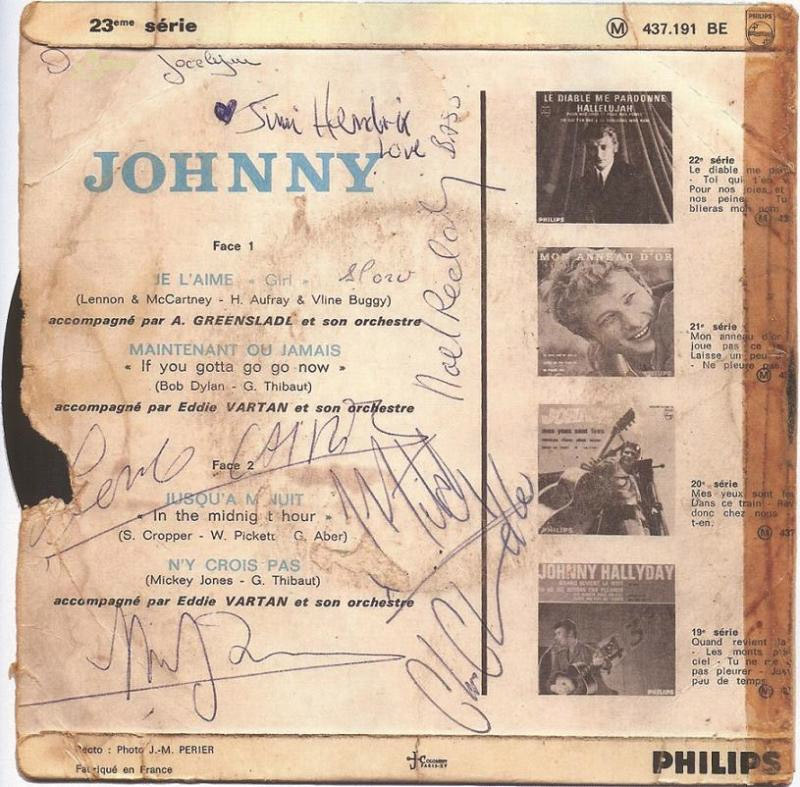 Jimi, Mitch and Noel autographed the back of her E.P. Thanks to Yazid Manou for bringing this to us.